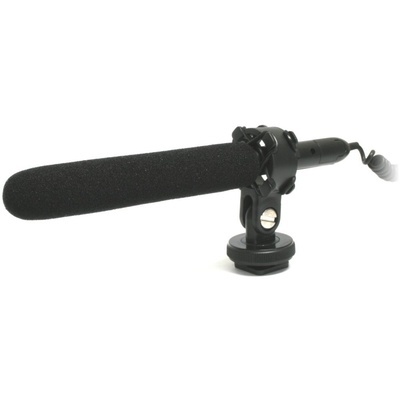 Product #16025 | SKU MIC-120 | 0.0 (no ratings yet) Thanks for your rating! The Wasabi Power MIC-120 is a lightweight hyper-cardioid or shotgun microphone that is ideal as an alternative to a handheld wired microphone. With its narrow pickup angle and a tight cardioid polar pattern, the MIC-120 was designed to be most sensitive to sound coming directly into the front of the barrel. Sounds from the sides and rear are greatly attenuated. Inside the body, two miniature button batteries (included) will provide up to 100 hours of continual use. Outside the body, you will find on/off and attenuated switches. Also included is a windscreen which will greatly silence wind noise when using the microphone outdoors. To prevent equipment noise, the microphone is suspended within four vibration-absorbing elastic bands in the center of its mount.